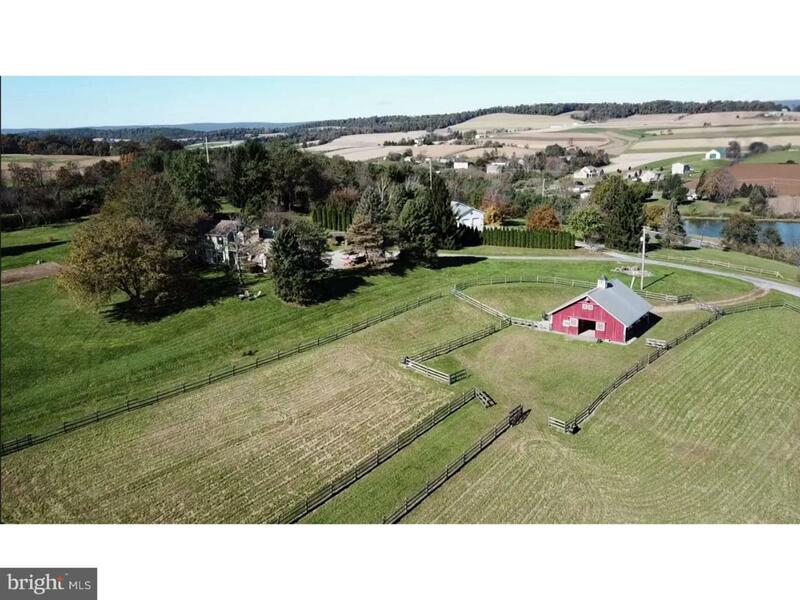 A long gentle driveway leads to "Farm at Little Hill" a gem of a horse property perfectly poised on a hill-crest to capture the splendid views this area has to offer. The stunning 36x36 hand-crafted wooden barn completed in 2015 offers five spacious 12x12 stalls with interlocking thick rubber mats, a charming brick aisle-way and a tack room with small fridge. The loft can hold about 100 bales of hay & 50 bales of shavings according to the owners and has 4 outlets for fans. The insulated roof helps prevent condensation. It also has snow guards for the safety of both humans & creatures. The thought that went into this well-designed property facilitates keeping of horses or other livestock. Swales around the barn help with drainage. 4 gated pastures have a mixture of Bluegrass, Timothy, Fescue and were completed in 2015. Locust posts with hemlock rails screwed-in place. Electric wire runs on top. Frost free hydrant supplies water to hoses that reach the pastures. Small area near barn where horses can be lunged or turned out in inclement weather. Previous boarders rode on top field ? perfect site for indoor/outdoor arena. Attractive passive solar home built with 2x6 exterior walls, double pane Pella windows, updated eat-in kitchen complimented by granite counters and PA White Ash random width plank flooring. Approximately 3,085' of living space including lower level. Living room opens to spacious covered stone patio with Bose speakers and columns to support upper deck enjoyed by master bedroom. Dining & living room floors have been refinished. Tiled floors in laundry room & ~ bath. Basement is finished & has 2 bedrooms & bathroom. It can be used as an in-law apartment but has no exterior entrance. Heated & insulated 2 car garage. Shared driveway & utility easement. Listing courtesy of Cindy Stys Equestrian & Country Properties Ltd.